The article introduces a model which might be used for supplying spare parts of ground forces technical equipment to the Army of the Czech Republic. When designing inventory management, an Economic Order Quantity (EOQ) model is applied. It is a classical model used to determine stock order quantity. When setting the model, stock classification based on the ABC method and the EW matrix is made. Following the stock classification, for the Army of the Czech Republic we would suggest determining a signal stock level which is the same as for the Q-model of a stock management system. In this model used to optimize the stock we apply a dynamic model with absolutely determined stock movement, a dynamic multiproduct model where purchase cost is constant, and a dynamic model completed by a temporary unsatisfied demand. The important aspects which should be taken into consideration when setting an inventory model are stock purchase cost, storage costs, stock holding cost, or the cost which arise due to a short supply. The methods of remote vibration diagnostics realization of metal-rolling department’s equipment will be considered in the article, and also the example of the really set system is resulted. Application of this system allows not only exposing the state of workings parts of mechanism presently, but also carrying out the prognosis of equipment’s working capacity. The recently issued IMO requirements for reduction of GHG emissions for shipping reinforced the attempts to increase the energy efficiency of ships. One of the measures prescribed by IMO is Ship Energy Efficiency Management Plan (SEEMP). This, among other things, involves trim optimization. Trim i.e. difference between the draft at the bow and the stern is controlled parameter worthy of attention with respect of fuel usage and GHG emissions while the ship is cruising. It is shown in this paper that the powering performance of vessels varies with different trim conditions. The main objective function of the trim optimization is the powering performance (resistance and propulsion). The objective of this paper is to analyze the physics behind the effect of varied trim on ship resistance and propulsion, to detect the origin of this effect. In particular are examined the change of total resistance depending on the change of some parameters such as length of waterline (hence frictional resistance), submerged surface , change of the residual resistance, wave making/breaking at the bow and analyzed in terms of and viscous – pressure resistance (form-factor). Also examined are parameters influencing the powering performance as: thrust deduction, wake fraction, relative rotative efficiency, and propeller efficiency when the ship is trimmed. This analysis has been based on experimental data of particular ships. Parameters of the vehicle undercarriage affect the vehicle movement and its behaviour on the road or on the terrain. Basic geometry of the vehicle undercarriage can be expressed by mathematical methods, yet undercarriage analysis of the moving vehicle on the terrain is very complex procedure. We have to take into account wheels vertical movement and deflection (which influences the suspension system). Utilization of the simulating technologies can be very beneficial for solution of this issue. 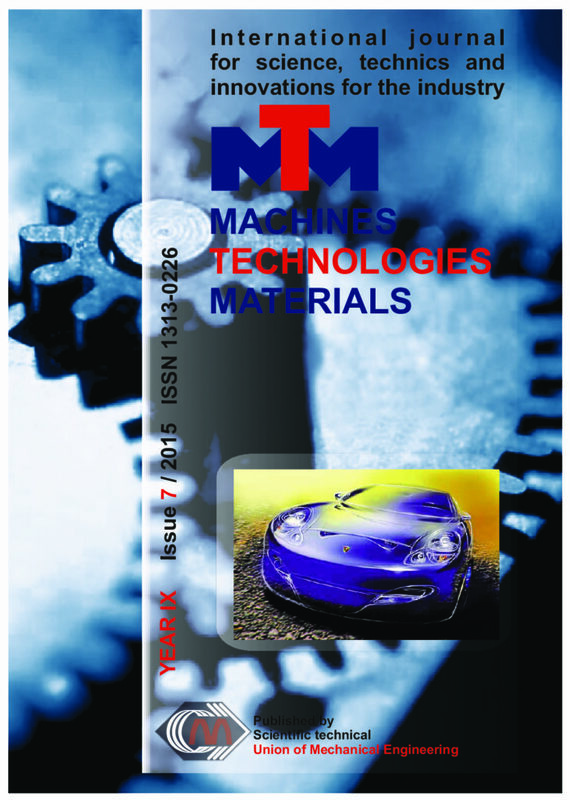 The paper is focus on mathematic model of the vehicle undercarriage and its application for analysis of the vehicle undercarriage. The effect of changing coating length on the cohesive and adhesive failure of the coating on metallic flat substrates is analyzed by uniaxial loading. The criterion for determining the fragmentation length of the coating with mixed (adhesive-cohesive) failure was developed. Calculating the critical length as the intersection point of the two lines (interfacial failure shear stress-length curve and the normal failure stress-length curve) does not always give correct value. The critical length of coating should be evaluated as maximum value within the annular trapezoid. It is established that the kind of probability density function both the adhesion strength and the cohesion one should be considered when determining the critical length of the coating. Verification of the developed criterion was performed on the example of plasma-sprayed coatings. It was noted, the formation of multiple cracks in the plasma-sprayed coating has random character due to microstructural defects, such as pores and microcracks. Behavior of a specific constructive scheme of a tricopter is modeled. On the base of real characteristics of propeller-motor system, a model of the motion of the yaw mechanism is worked out. A flight stabilization method is proposed. The paper presents a method for calculating the durability of structure regular zones in view of working stresses and aircraft routine flight profile. Application of the method is advisable at the early design stages. The method is based on the discrete atmospheric turbulence model and dependence model for durability calculation by nominal stresses. Fatigue damage for a routine flight has been determined as the amount of damage due to accidental loads and the damage resulting from enveloping ground-air-ground cycle, naturally repeated during each flight. It has been noted that the consideration of the fatigue curve break point in the low-stress area leads to an increase in the calculated durability by 10-15%. A comparison has been made of the calculated durability values for two airplanes with the experimental data of TsAGI. The correlation is satisfactory enough. The article deals with a problem of fatigue load calculations when designing the aircraft wing. Much of fatigue damage is done to the wing by occasional air gusts in turbulent atmosphere. Therefore, the author considers the pattern of continuous atmospheric turbulence that gives an idea of low-altitude gusts. It is at low altitudes that nonstandard flights are performed for which it is wrong to use the statistical data on fatigue damage available from the previously operated airplanes of the same class. The method is offered to determine the equivalent bending moments along the wing span in discrete flight modes and within the entire routine flight. The above method takes into account the profile parameters of routine flights, the dynamic vibrations of the wing and fatigue characteristics of the structural material. To prove the reliability of the method the calculation results have been compared to those of medium-range aircraft testing flights. The article discusses a calculation procedure for determining the load distribution on the screw threads under general load conditions. Four basic loads schemes are considered and equations for calculation of load distribution are given. Symmetric and asymmetric triangular, round and rectangular thread profiles are used. The geometrical parameters of thread profiles and accuracy of thread manufacturing are taking into account. Automobile shock absorbers are an important part of the vehicle suspension, which directly affect the driving comfort and maneuverability. Therefore, they direct impact on the safety of their operations. Wrong technical condition of the car shock absorbers can cause extension of braking distance by up to 20%. In actual service station practice, the automotive shock absorbers are diagnosed by several methods. This article presents the results of measurements of automotive shock absorbers on various diagnostic devices. During testing, on the vehicle there were replaced shock absorbers and they were compared with the results of the technical condition before and after the exchange. The article is about the possibilities to diagnose the technical state of transfer mechanism of road motor vehicles. The diagnostic is done on a performance dynamometer, which measures the resistance of transfer mechanism during the coasting of rolling mass. The resistance makes itself felt like power losses by the movement of vehicle, which afects directly dynamical characteristics and fuel consumption. By the measurement we can quantify its value, what is the sign of the technical state of the mechanism. Paper deals with finite element buckling analysis of shear deformable beam-type structures. Displacements and rotations are allowed to be large but strains are assumed to be small. The corresponding equilibrium equations are formulated in the framework of co- rotational description, using the virtual work principle. Displacements and rotations are allowed to be large while strains are assumed to be small. Linear shape functions are used for the axial displacement, while cubic shape functions are employed for transverse displacements and angle of twist. The algorithm is validated on test examples. Power transmissions in motor vehicles are one of the key elements of the overall quality of the whole system and therefore special attention should be paid to this issue. In order to find the simplest solution for general purposes that fully complies with the requirements for the application on motor vehicles of the categories M and N, a test bench is designed with the configuration in the form of "closed-loop" which allows testing of virtually all elements and assemblies of the power transmission in a wide range of operating regimes and load conditions. Application of the configuration with two gearbox transmissions and a larger number of shafts and cardanshafts gives the possibility of parallel testing of various solutions in the early stages of transmission development, which significantly speeds up the process of finding the optimal solution. Implementation of the brake mechanism in the contour allows testing of differential mechanisms by changing regimes without stopping the test bench. Simple procedure enables variation of driveshaft’s angles to a considerable extent, covering most of the real operating regimes. This configuration of the test bench contains all the elements of the transmission and provides quick insight into the critical points that may lead to a system failure. The article deals with the steganography system which hides text inside images without losing data. The secret message is hidden in the cover image using Least Significant Bit (LSB) algorithm. To evaluate steganography system properties the measures like Signal-to-Noise Ratio (SNR), Peak Signal-to-Noise Ratio (PRSN), Mean Squared Error (MSE) and Structural Similarity Index for measuring (SSIM) are used. Experimental results show the advantages of the described steganography system. Portal Cranes are used for load carrying in industrial and transportation sites. They have complex structure with big dimensions and many mechanisms with high security requests. In this work, we will study the influence of load swinging in dynamic behavior of Single girder L- type portal crane, in case of forward motion- travelling with full loading using computer modelling and simulations. Studying the behavior of portal cranes proves to be difficult using physical experimentation and measurement devices. Creating the crane’s computer model and applying simulations is useful method to study dynamic occurrences, which helps explaining the reasons of oscillations, failures and accidents of cranes, and gives conclusions that can be useful for design considerations and safety. The analysis will be concentrated in finding the nature of forces, moments and stresses that acts on crane’s construction and effects the stability, particularly at the start and end of travelling motion. Also, the study will look to find main parameters that contributes on the negative effects of load swinging. For this purpose, we designed “virtual portal crane” using model design and simulation applications. Crane is modeled from standard manufacturer, as a common model of L type portal cranes.